July | 2013 | LIT.GAZ. Having recently re-watched the film – effectively atmospheric and a pretty faithful rendering of the book, though inevitably cutting and oversimplifying the plot and changing some details for visual effectiveness – I decided to return to the novel. This was, I think, the fifth time I’ve read it, and it retains its place in my top three novels of the twentieth century. 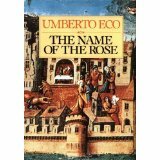 Eco is at his best in the mediaeval world he knows and loves (Baudolino is his next-best novel, I think) and he brings it vividly to life as he creates sympathy and understanding for most of his characters: we do come to see just how differently people saw and interpreted the world in the fourteenth century. He successfully weaves at least three plots together: the political and religious issues involving the papacy and the empire, the quest for Aristotle‘s missing book On Comedy, and a series of murders in the monastery which involved either this missing book or some secret documents relating to a heretic and his followers. He clearly loves Sherlock Holmes, and his main character and his companion are obvious tributes to Conan Doyle‘s heroes. There’s an originality here – the mediaeval setting has, of course, been frequently copied since this novel was first published – the unashamed intellectualism interwoven with the plot, and the desire to have the reader reflect on things eternal even if s/he is an unbeliever, which make this a truly outstanding novel. And I still get a lump in my throat as I come to the end. This novel had sat around for a long time waiting for me to get to it; what a revelation, as it was well worth waiting for. Isabel Allende’s uncle was Salvador Allende, the Marxist elected President of Chile in 1970, and murdered in a US-backed coup in 1973. This event was one of the most shocking of my younger days, and made me realise just how difficult any meaningful political change anywhere in the world was going to be. 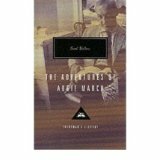 Allende writes in the familiar Latin American ‘magic realism’ genre, reminding one easily of Marquez’s great novels. She traces the history of her country – never named, but clearly Chile – through the story of the successes and failures of several generations of one family, against the backdrop of more general social and political change; this family becomes more closely involved with the movements that led up to the events of the 1970s as the story nears that time. The lyrical portrayal of a loved country and people develops very effectively; one comes to know and love the range of – sometimes bizarre – members of the family, their houses and country estates. It is magical realism at its captivating best, but obviously there is always in the back of the reader’s mind the traumatic events of forty years ago, and one of the things that drew this reader along was wondering how Allende would integrate them. The chapters that deal with the coup and murder of the president are a kick in the crotch to the reader; the brutality leaps out, and characters we have grown to know and like are sucked into the nightmare; the magic vanishes and the reality is devastatingly effective. I enjoy reading travel writing. And, if someone has gone somewhere out-of-the-way and interesting, a decent map in the book is essential. Surely, not too much to expect? But yes, it seems. In their quest to save money, too many publishers either omit maps entirely, or else provide one so small or rudimentary as to render it useless. Yes, I do have an atlas, a very good one, too, but an atlas will supplement the writer’s account of their journey, and the map they should provide of it. This post is provoked by Christina Dodwell‘s book Beyond Siberia which I’ve just read. It’s as annoying as the previous one of hers I wrote about earlier, in terms of poor writing and proof-reading, but it was about Kamchatka, where very few people have been, and no doubt, about where even fewer people have written. And we got a scratty page-size, blotchy map with some of the places she mentions on it, apparently at random. Why bother? The plot rambles and wanders all over the place – the concept itself is vaguely interesting, which is why I decided to read it in the first place – but, as my research revealed, it’s thinly disguised autobiographical wish-fulfilment on the part of the writer. Things one might expect to have explained, such as how an unordained Englishman happens to be in the conclave in the first place, never mind being chosen as pope, or how he then manages to convince the entire world and its leaders to follow his plan for peace and happiness ever after, are glossed over unconvincingly. Vatican infighting is a little more convincing, though under-developed, and the mad socialist is a totally unconvincing plot device to allow the writer one of his many diatribes against the world and everything… the one event in the book that surprised me was the shooting of the pope, which reminded me of the attempted assassination of John Paul II. I’m pleased I read it, but it really is a bad novel in so many ways – just like McGonagall’s poetry…weird!